The mid-1800s was a turbulent period in Scottish history, and Glasgow was the centre of great discontent. Glasgow's slums were the filthiest in Britain, the burgeoning population was 18 per cent Irish, and workers were demanding greater rights through the Chartist reform movement sweeping the land with strikes and dissent. 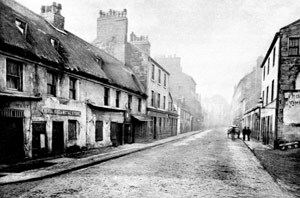 Above right: a photo of Main Street in Govan Glasgow in 1868. This is near where the Alexanders lived. The Alexander family was in the middle of this squalor and strife. They wisely saw a chance to improve the lot of their growing family and sought a new future through assisted migration. In August 1852 they travelled to Birkenhead near Liverpool and embarked on the James T. Foord, a three-masted sailing ship of 790 tons. After a horrendous sea voyage lasting 19 weeks, the James T Foord arrived in Port Phillip Bay and by Christmas Eve the passengers were cleared to disembark. The Alexanders had timed their run to perfection. In 1851 Edward Hargreaves had reported the first gold at Bathurst NSW, and six months later gold was discovered at Ballarat, then Bendigo. The news stormed around the world and 370,000 immigrants poured into Australia in 1852 alone. Victoria would soon produce one third of the world's gold output. William Alexander, wife Mary and the children David, William and Jane (Jean) thus disembarked at Geelong to a new world shaped by 'gold fever'. The first leg of the long and circuitous journey to Tocal was completed, while Charles's birth was still 12 years away. The table below shows the 1851 Census for the Parish of Gorbals in Glasgow. The Alexander family was living at 204 Thistle Street.